The view, it looks like a Brueghel, no? Oh, so much culture. Everybody, pinkies out! Okay, pinkies down. I enjoy a museum, but there’s nothing better I like during a vacation in a new place than (a) going to the supermarket and (b) going to the mall. Very soothing. If I went to business school, I think it would be interesting to do a case study about what makes a yarn store successful. 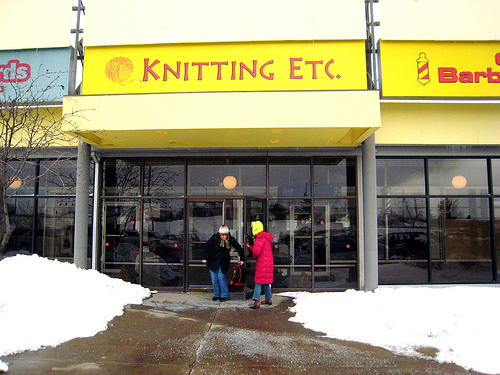 Homespun had location (the Commons, located in central Ithaca), a nice and knowledgable owner, a better selection of yarn, and a cozier store, but Knitting Etc. was packed with people, despite being located in the Mall of Doom. I would have had to visit both more regularly to figure out if this was an abberation, or a reflection of their normal clientele numbers. I’m not really sure why Knitting Etc. was so hopping (though it did have a class going on), but it’s worth contemplating. Knitting Etc. does have a great website, as well as a regular newletter with some nice patterns that you can download off their website. And the store itself was quite big, with a great selection of books, and knowledgeable sales staff. I think that Homespun had a better yarn selection though. Hi. I’m sorry to miss you when you came to the store last Sunday! My wife, Hickory, owns Knitting Etc. Although we’d love to meet everyone who comes through, Sunday is our day off so we can have a life. It’s very hard because some Sundays can get very busy so we know we don’t get to meet a lot of people on Sundays. Last Sunday was pretty “average” so I hope Calia and Elly could attend to your needs and answer your questions. We’d love to meet you next time you are in Ithaca. Both Hickory and I usually work there on Saturdays.